» Friendfeed for scientists: What, why, and how? Friendfeed for scientists: What, why, and how? There has been lots of interest amongst some parts of the community about what has been happening on FriendFeed. A growing number of people are signed up and lots of interesting conversations are happening. However it was suggested that as these groups grow they become harder to manage and the perceived barriers to entry get higher. So this is an attempt to provide a brief intro to FriendFeed for the scientist who may be interested in using it; what it is, why it is useful, and some suggestions on how to get involved without getting overwhelmed. This are entirely my views and your mileage may obviously vary. FriendFeed is a ‘lifestreaming’ service or more simply a personal aggregator. It takes data streams that you generate and brings them all together into one place where people can see them. You choose to subscribe to any of the feeds you already generate (Flickr stream, blog posts, favorited YouTube videos, and lots of other services integrated). In addition you can post links to specific web pages or just comments into your stream. A number of these types of services have popped up in the recent months including Profilactic and Social Thing but FriendFeed has two key aspects that have led it to the fore. Firstly the commenting facilities enable rapid and effective conversations and secondly there was rapid adoption by a group of life scientists which has created a community. Like anything some of the other services have advantages and probably have their own communities but for science and in particular the life sciences FriendFeed is where it is at. As well as allowing other people to look at what you have been doing FriendFeed allows you to subscribe to other people and see what they have been doing. You have the option of ‘liking’ particular items and commenting on them. In addition to seeing the items of your friends, people you are subscribed to, you also see items that they have liked or commented on. This helps you to find new people you may be interested in following. It also helps people to find you. As well as this items with comments or likes then get popped up to the top of the feed so items that are generating a conversation keep coming back to your attention. These conversations can happen very fast. Some conversations baloon within minutes, most take place at a more sedate pace over a couple of hours or days but it is important to be aware that many people are live most of the time. So how is FriendFeed useful to a scientist? First and foremost it is a great way of getting rapid notification of interesting content from people you trust. Obviously this depends on there people who are interested in the same kinds of things that you are but this is something that will grow as the community grows. 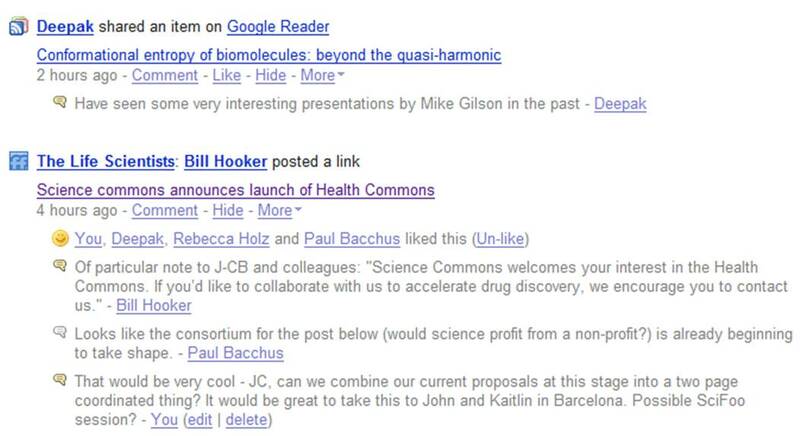 A number of FriendFeed users stream both del.icio.us bookmark pages as well as papers or web articles they have put into citeulike or connotea or simply via sharing it in Google Reader. Also you can get information that people have shared on opportunities, meetings, or just interesting material on the web. Think of it as an informal but continually running journal club – always searching for the next thing you will need to know about. But FriendFeed is about much more than finding things on the web. One of its most powerful features is the conversations that can take place. Queries can be answered very rapidly going some way towards making possible the rapid formation of collaborative networks that can come together to solve a specific problem. Its not there yet but there are a growing number of examples where specific ideas were encouraged, developed, or problems solved quickly by bringing the right expertise to bear. We are still a long way from the dream of just putting out a request and getting an answer but it is worth point out that the whole exchange here lasted about four hours. Other collaborative efforts have also formed, most recently leading to the formation of BioGang, a collaborative area for people to work up and comment on possible projects. So how do I use it? Will I be able to cope? FriendFeed can be as high volume as you want it be but if its going to be useful to you it has to be manageable. If you’re the kind of person who already manages 300 RSS feeds, your twitter account, Facebook and everthing else then you’ll be fine. In fact your’re probably already there. For those of you who are looking for something a little less high intensity the following advice may be helpful. Pick a small amount of your existing feeds as a starting point to see what you feel comfortable with sharing. Be aware that if you share e.g. Flickr or YouTube feeds it will also include your favourites, including old ones. Do share something – even if only some links – otherwise people won’t know that you’re there. Subscribe to someone you know and trust and stick with just one or two people for a while as you get to understand how things work. As you see extra stuff coming in from other people (friends of your friends) start to subscribe to one or two of them that you think look interesting. Do not subscribe to Robert Scoble if you don’t want to get swamped. Use the hide button. You probably don’t need to know about everyone’s favourite heavy metal bands (or perhaps you do). The hide button can get rid of a specific service from a specific person but you can set it so that you do so it if other people like it. Don’t worry if you can’t keep up. Using the Best of the Day/Week/Month button will let you catch up on what people thought was important. Join the Life Scientists Room and share interesting stuff. This provides a place to put particularly interesting links and is followed by a fair number of people, probably more than you are. If it is worthy of comment then put it in front of people. If you aren’t sure whether its relevant ask, you can always start a new room if need be. Enjoy, comment and participate in a way you feel comfortable with. This is a (potential) work tool. If it works for you, great! If not well so be it – there’ll be another one along in a minute. 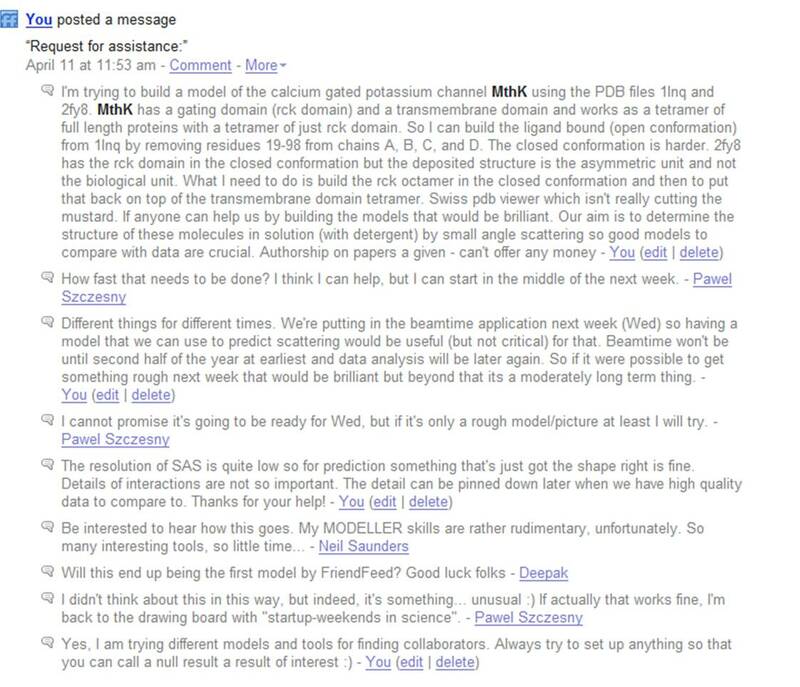 Hi Ntino, yep – we should cut and paste both of those across – also some of Neil Saunders and Deepak’s early posts on the subject. I like the idea of writing it up and popping it on Nature Pre and then taking a pop at Nature Methods or similar for publication. Trouble is I’ve got to say I don’t have much time to write another paper at the moment. I’m four behind as it is… but feel free to re-use and re-mix any text and I’ll try to muck in when I can.